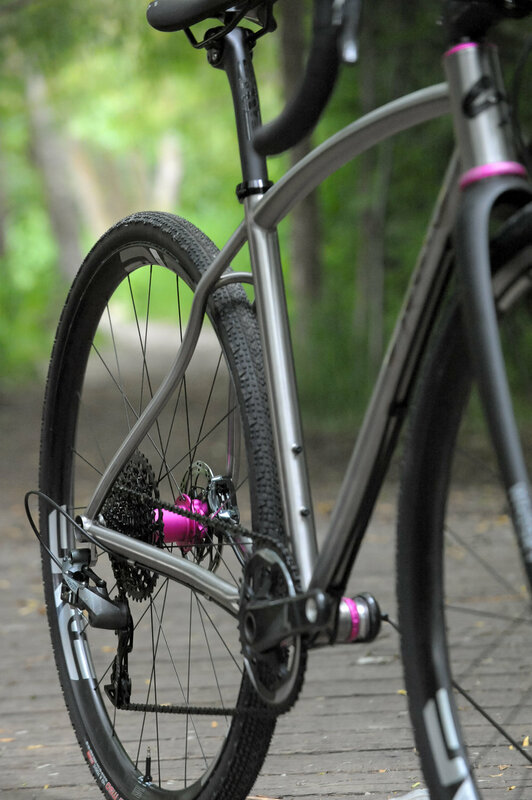 Lori's Titanium All Road — Sklar | Handmade Bicycle Frames. Mountain, Cyclocross bikes built to order. When Lori first got in touch about a new bike, she told me that she was looking for her "forever bike". A transition from serious Cyclocross racing into more riding for fun with the occasional gravel event was on the horizon and she wanted a bike that not only would let her move into those longer more variable rides, but also something she could keep forever. A trusty bike, for any occasion. Titanium was the obvious choice for this build for those reasons. Harder to dent, no worries about rust, more comfort for spending all day on the bike and not to mention the fact that a well-built metal frame will surely outlast all of us. To compliment Lori's new frame, we went all-out on some really nice parts. Wheels, cockpit and controls from ENVE, Bearings from Chris King - It's hard to miss that matte punch - and shifting provided by SRAM Force, my go-to for the 1x all-road or gravel bike set ups. This frame and fork use flat mount brakes, and for as much as I dragged my heels going in... it's here to stay and certainly provides a clean look to the bike. Lori's Bike is headed to the Northeast and I can't wait for her to get out and spend some time on it. These are the type of bikes that become the one you always reach for, and I hope that is the case for her.